His posthumous celebrity aside, two ideas that guided much of his short life’s work are worth considering: academic open access and open government. A powerful line of inquiry informed Swartz’s thinking: What should be in the public domain, and what might properly remain closed or proprietary? These are not abstract issues: Access to knowledge empowers people in a very real sense — and the lack of access disempowers them. Increasingly, the status of information becomes a question of equality, and a moral issue. The concept of “open access” was born long before Swartz downloaded that first set of JSTOR articles in fall 2010, but has accelerated since. Research suggests that perhaps half of all new studies can be accessed for free, but important material remains costly. Even large libraries struggle to pay escalating fees from publishing companies. The Pew Research Center has found that nearly three-quarters of Americans look for health care information online; a quarter of those report running into an online paywall. Only 2 percent end up paying the fee demanded by publishers, often $30 or more for a study. The National Institutes of Health database now houses more than 2 million open articles, but more than 20 million are locked away elsewhere. 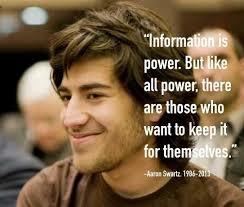 Open government was also an area of intense interest to Swartz. He worked to improve access to public-domain materials — for example, downloading and providing free access to federal court records, for which the government had been charging. In the Obama era there has been much hype around open government, yet progress has been halting. A new investigation by the Center for Public Integrity found that the information practices of the Federal Election Commission, a crucial window into our political campaigns, remain woeful. Even good-faith technical efforts, such as Data.gov, have had mixed success. To honor Aaron Swartz, we should all try to carry on his important work and help realize the promise of the internet for all.